Q Athletics is located inside The Campus. We are centrally located, just minutes off The Greenway and Rt. 28. FUNCTIONAL MOVEMENTS: How to properly squat, hinge, jump, rotate, push and pull. In addition, we believe that continuity is an important aspect in developing athletes so they will only have 1 trainer/program. 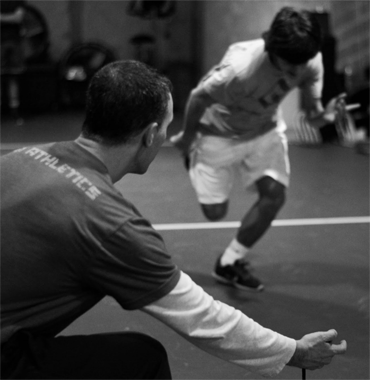 We do not rotate trainers, instead designate them to a program from beginning to end. For almost 12 years, Owner, Bobby Quarantillo has been preaching this simple fact to clients and parents in Loudoun County. Being located inside The Campus now allows Q Athletics to time athletes on 40 yd sprints indoors on their 50 yd sprint track. In addition, the Broad jump, Vertical jump, Pro Agility shuttle and several other tests are used to quantify improvements with all our athletes. Our daughter Lydia enrolled in Q ATHLETICS with the goal of improving stamina, strength and speed to support her performance in lacrosse and field hockey. The changes we have seen in her self-esteem and confidence, let alone her fitness have been incredible. Lydia enjoys her personal coaching sessions and looks forward to the new challenges presented each week. The one on one coaching sessions have directly contributed to her selection for regional and national travel lacrosse and field hockey teams. We strongly recommend Bobby Q to any young female athlete irrespective of age, fitness or sport.